Drinking day already started around 12 o’clock on a Friday and then continued… sometimes till well after midnight. We socialised from the one bar and dance club to the next. On Saturdays I looked forward to 10 o’clock, because by then “the Boeing had passed” and the first beers were opened. It goes without saying that the rest of the weekend was unfruitful and totally wasted as a result. Many a time I could not even remember how I drove home. It now takes back my memory where we would go on holiday; me and my two sons, Gerhard and Jacques – always with the cooler box on the back seat. I might have forgotten to pack other stuff, but never the cooler box. That had to be stocked. As soon as we ‘hit the road’ I would ask for cider or a beer – and that used to be what I thought was an enjoyable holiday. Today I can only thank the Lord for His wonderful grace and protection over us and the fact that my sons are lovely grown men NOT following mom’s old footsteps. I thank the Lord that I never caused an accident. With the drinking I started smoking dagga. With the drinking and smoking depression got hold of me. Dagga became my sleeping pill. I eventually ended up in Denmar where I was given a hand full of tablets – “the part of my brain that controls my emotions did not function properly”. Remember, I NEVER told the doctor about my drinking and smoking habits. I was like a ‘zombie’ at work – did not want to look people in the eyes. The bubbly Linda became an introvert not wanting to socialize or talk to others. I can remember a friend saying to me: “Please Linda, we want the old Linda back”. It was early one morning when I walked through that banking foyer that I realized I can no longer carry on this way, be somebody that God never intended for me to be. That morning I reached out to God, I went to the bathroom on the first floor, kneeled down in front of the toilet and started praying –“Please help me. Help me Lord, because alone I cannot do it!” I wept and cried and God heard my cry. He always listens to the honest heart. I more than ever before felt the closeness of God. My life changed completely. You see, once you know your identity in Christ, you can no longer carry on with the wrong. I joined church groups, even ran a sell group from home. I learnt about the CAD (Christians Against Drugs), joined a friend who went to the support group and soon realized what a difference it made in my own life, the more I testified and told others about my ‘terrible’ stories the more I was freed from all the things that was still not right in my life. Know that changes does not always happen overnight – although I have to give God the glory and the honor – I gave up smoking just like that – almost like a flick of the finger. For the past many years my diary has been booked out for Monday evenings. 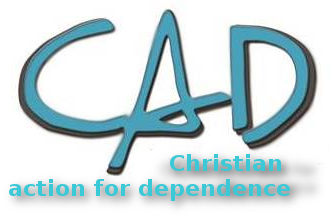 The CAD’s support groups meet on a weekly basis all over the country. I know how difficult it is to climb that mountain by yourself and that is why I want to encourage you to join the CAD or even start a CAD support group. If YOU can give the first step, God, the one who knows your heart, will support and help you. The CAD members and friends are there for you, in good times or bad. We believe if you have a will to change you have already won half the battle. God’s grace is so enormous, He never blames, He never looks back, He always forgives. Remember he knows the honest heart and He will through the support of CAD groups, help you to see the bright side again. The life really meant for you and me. CAD support groups make it easier for you. In these groups you can share your love and sorrow and talk to people that understand. We know that no one is perfect. Don’t get caught because you are to proud. The people at the CAD really cares for YOU and the people close to you. Not only are we there for the substance dependent persons, we are there for ALL. Don’t we all sometimes go through difficult times in our lives? Why not today, decide to take the first step towards a sober, joyful and peaceful future? You ARE God’s chosen one and CAN help another to live a better life. Remember: With God nothing is impossible!